Touted as the largest passenger steamship at the time of its construction, no one thought that the RMS Titanic could be brought down by a giant block of ice. 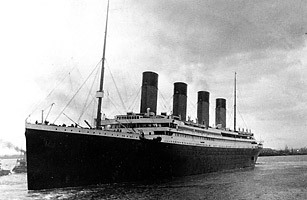 A few days after departing on its maiden voyage on April 10, 1912, the ship's captain steered the vessel slightly southward in response to warnings that dangerous icebergs lay in their path. But the change of course didn't yield a change in fate: the luxury liner collided with an iceberg just before midnight on April 14, which breached the Titanic's starboard hull and sent the mammoth ship teetering into the icy deep. While the Titanic's designers employed the most advanced technologies of the day, they only included enough lifeboats for 1,178 people. (The ship's maximum capacity was 3,547.) Over two-thirds of the ship's 2,223 passengers perished. Read an interview with two Titanic wreck divers.